Zinc is an essential mineral that plays a variety of important functions in the body. While generally healthy when taken in doses of 300 milligrams or less a day, excess zinc consumption can lead to poisoning that may cause a variety of symptoms, including orange-colored urine. For best results, monitor your urine regularly to make sure it remains a light yellow, indicating proper hydration. Zinc plays an essential role in more than 300 separate reactions in the body, including: carbohydrate metabolism, insulin regulation and the maturation of sperm cells, notes MayoClinic.com. 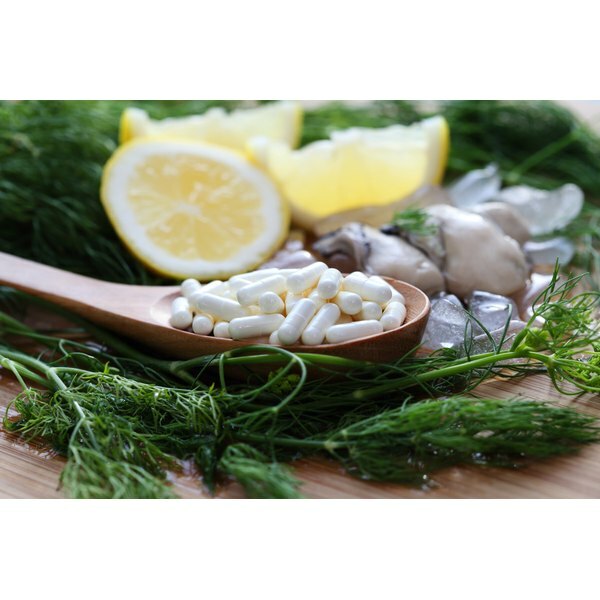 While most balanced diets contain the required amount of zinc, some alternative health practitioners recommend zinc supplements and lozenges as a preventive treatment for the common cold. Zinc generally does not affect urine color when taken in doses of 300 milligrams or less per day. Urine color is a common indicator for proper hydration, sickness or toxicity. While many cases of discolored urine occur because of medications and food dyes, some urine colors are commonly associated with different health conditions. For example: red or pink urine is sometimes caused by bladder stones, urinary tract infections, enlarged prostate, kidney cysts or hematuria, or urinary blood. Medications such as Rifampin and phenazopyridine, or foods such as beets, blackberries and rhubarb may also discolor urine. According to PetWellbeing.com, zinc toxicity in animals may cause symptoms of red or brownish-orange urine. Unfortunately, results in humans are typically inconsistent, and most cases of urine discoloration arise from taking certain medications. Microscopic urine tests are typically performed to isolate the causes of certain symptoms. According to the “Journal of the National Medical Association,” pus in the urine shows chronic degeneration in the urinary tract, while blood may be indicative of hemorrhage and inorganic salts point to stone formation in the kidneys or bladder. While some of these conditions may occur in individuals with heavy metal poisoning, such as zinc toxicity, there is no recorded level of urine discoloration as a result of moderate zinc intake. For example: an accident report published in the “Case Reports” journal followed the symptoms of a 34-year old man who ingested high quantities of zinc in volumes of one to two grams a day for many months. Although the patient developed a number of unpleasant conditions, such as sideroblastic anemia and fatigue, he did not exhibit symptoms of discolored urine. When in doubt, only take zinc supplements under the supervision of your doctor or health care provider. Like iron, zinc is required in moderate amounts to provide ample nutrition in the diet. However, taking too much can lead to heavy metal poisoning, which may manifest in a variety of negative symptoms. Never exceed the recommended dosage printed on your product’s label.